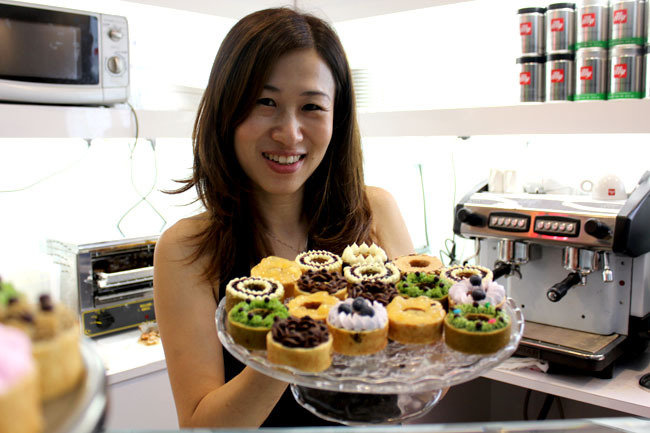 [Updated 18 Sep 2014] WHEAT, previously known as Wheat Baumkuchen, has reopened at the basement of One Raffles Place. This reminds the favourite of many lunch time crowd goers, who praise their healthy sets of soba noodles, brown set sets and salads. This time, I went for a Bull Run ($8.00) which got me confused initially because it didn’t have ‘bull’ or beef but Grilled Teriyaki Chicken with Salad and Green Soba. The cold dish may get some getting used to, but the taste was refreshing, sauce tasty, and portion actually filling and satisfying. Yet not so much that it would result in a food coma after lunch. Shirataki Noodles gained some traction in Singapore for having low calorie (almost close to zero) and no carb. The thin, translucent, gelatinous traditional Japanese noodles made from devil’s tongue yam has no taste on its own, but Wheat’s version ($10.00) cleverly included sesame sauce and shredded chicken which gave the dish taste without the guilt. [Previous entry] It was Miss Tam Chiak who first introduced me this Japanese Baumkuchen cake shop at Toa Payoh, which diversified to sell Japanese noodles of a different style. 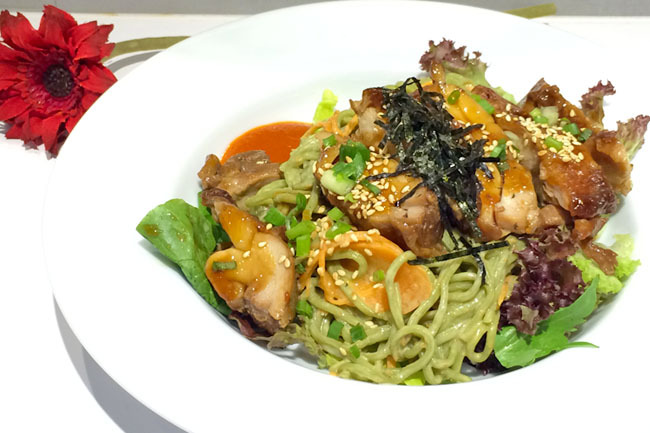 How does cold ramen, soba and white noodles cooked ‘pasta-style’ sound to you? 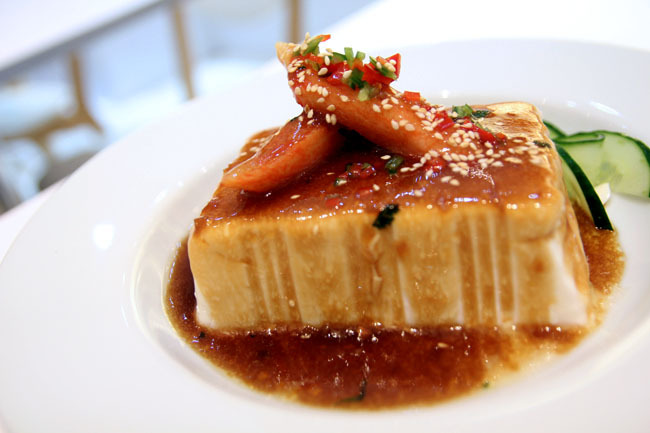 Or ‘Ice Cube’ ($3.00), which is cold tofu with crab meat and Thai-infused sauce. 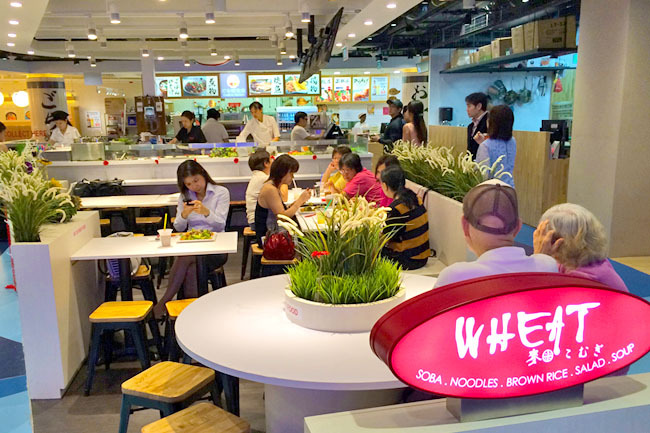 My friend Kenny who just works upstairs at One Raffles Place says he never tried this noodle bar because he would never eat strange noodles called Dolphin, Penguin, Whale and Seal. True that it sounds quite wrong. But these noodles are so-called, because they are named after animals staying in the cold climate. Wheat Baumkuchen which is unglam-ly located next to an escalator, proves to be a hit with OLs aka office ladies at the CBD. 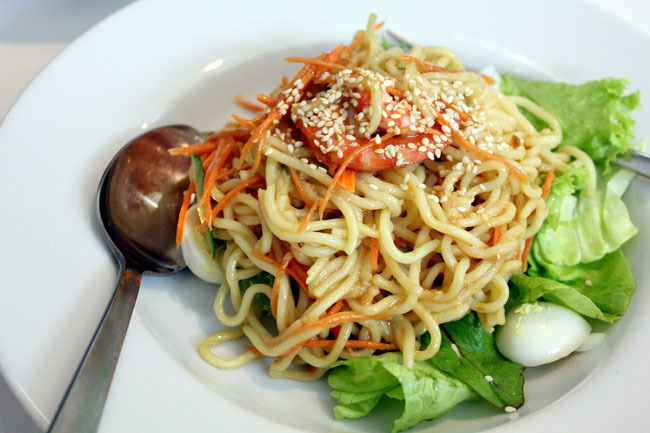 Let’s just say eating these noodles feels like downing a bowl of salad. You won’t feel guilty at all eating this. 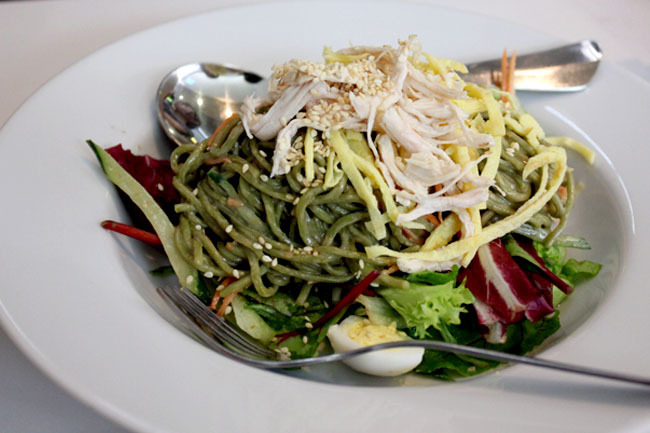 The OL popular dish seems to be the Penguin ($7.80) – green soba noodles with shredded chicken, fried eggs, quail eggs, Japanese cucumber mixed in roasted sesame sauce. The overall combination is very refreshingly oishii, and somewhat makes you feel you are dining at some foreign country. My Dolphin is ramen noodles in miso sauce with prawns, carrot, lettuce and quail egg. This may not satisfy heavy eaters (esp if you finished a workout at California Fitness opposite) because the portion is rather small. This is what I call simple healthy pleasures. The creative Dolphin dish is not something you get all the time. It is like what its name suggest – tasting cold, looking cute and somewhat delightful. I can’t agreed with you more. The noodles are very good!